Auto Lighting Optimizer (ALO) is a neat little feature that goes unnoticed by many but is pretty handy to have and is worth experimenting with. It enhances exposure and evens out contrast in images with less-than-ideal lighting conditions. It is automatically applied when you’re shooting in Full Auto, Creative Auto or any of the scene modes. 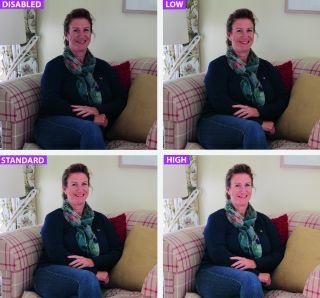 To disable or adjust the strength of the tool in-camera you must be in P, Tv, Av or Manual mode. It is set to Standard by default in the semi-auto modes, but disabled in Manual mode. ALO helps with underexposed or low-contrast scenes, and is useful when using flash or shooting backlit subjects. Once a shot has been taken, it analyses lighting and contrast, then modifies shadows and highlights to minimize loss of detail for a balanced exposure. If you use Canon’s Digital Photo Professional (DPP) software to process your Raw files, you can change the ALO settings that are applied to your images in-camera as part of your usual Raw post-processing workflow. You’ll find the Auto Lighting Optimizer feature in one of your camera’s shooting tabs in the main menu when shooting in Manual or one of the semi-automatic modes (P, Tv, Av). You can disable or adjust the strength of ALO to Low, Standard (default) and High by scrolling through and hitting Set. Experiment with all settings to achieve the desired effect. ALO is applied in-camera to JPEG images and to the LCD preview of Raw images. As Raw image previews are processed with settings including ALO applied, it will be reflected in the histogram.